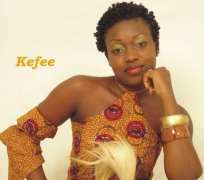 WITH a face glowing like that of a new-born baby, Branama Queen, Kefee announced to her fans and well-wishers that the storm is over with her. Speaking to Trendtainment recently, the singer who went through an over publicized break up with hubby and producer, Alex Godwin on accusations of infidelity said. “Everything has its challenges. Life comes with a lot of them. I was very used to Alec doing everything for me,” she disclosed, “so, for the first time in my entire life I had to take charge and assume the driver's seat and I felt very vulnerable and inexperienced. I was scared! I felt I couldn't do it. At a point I felt like running away. I am happy that God gave me the courage to hang in there and give my best,” she said. And to really show that she is indeed an independent woman, the recent release of her new album speaks volume of her capabilities to run things on her own. “The launch was a resounding success. The crowd was much and I performed live for my parents, a song I wrote for them called Do. People loved it. My parents and siblings in the country were around! My happiest moment so far was singing for my parents.” She said. It was indeed an event that attracted stars as far way as Gabon , Rwanda and Ghana . Other guests at the, launch included top government officials from Delta State like Chief Amori, Chief MO Igbuyi, among others. Also present was Stella Damascus Aboderin, comedian, Mandy, Lara George among others. And to show that she is really moving on, Kefee will soon launch her clothing label which will strictly produce what she styled as the Branama designs. “Branama AfriK basically is all about showing-off. It's a platform to showcase Africa. It is my fashion label and in 2009, you are going to be hearing more about it. It's about fashion, it's about women. I registered the company two years ago. What motivated it was that I wanted a clothes line for my own designs.